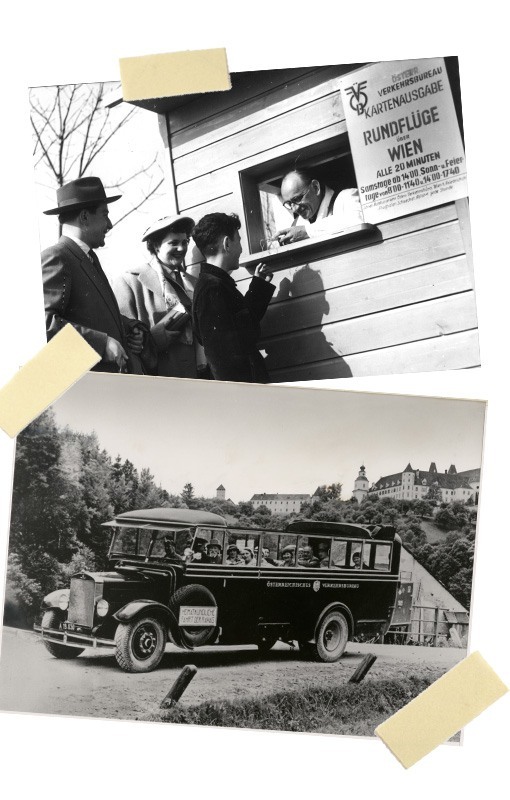 The Verkehrsbüro Group is celebrating its 100th birthday! We have been sending Austrians on holiday since 1917 – which means we have experienced a lot. Join us on a journey back in time with our old-timer bus and find out more about the largest tourism company in Austria. We follow Emperor Franz Joseph’s example and go on a summer holiday. In 1917 we buy our second-class tickets at the Verkehrsbureau counter and board the train. The steam railways gave tourism a boost. In the first years following its foundation it was the job of the Verkehrsbureau to promote the state railways. KÄTHE, TODAY I AM LYING ON THE TOP! In 1922 we reach our destination, the magnificent imperial and royal state railway station in Bad Ischl. It is truly splendid here and we treat ourselves to coffee and cake at the famous Zauner confectionary. Together with the postal administration, the Verkehrsbureau has introduced new bus routes. We soon take advantage of this and continue by bus to Lake Wolfgang. HOLD ON TO YOUR HATS IN THE OPEN-TOP BUS. A SIGHTSEEING FLIGHT OVER VIENNA PLEASE! 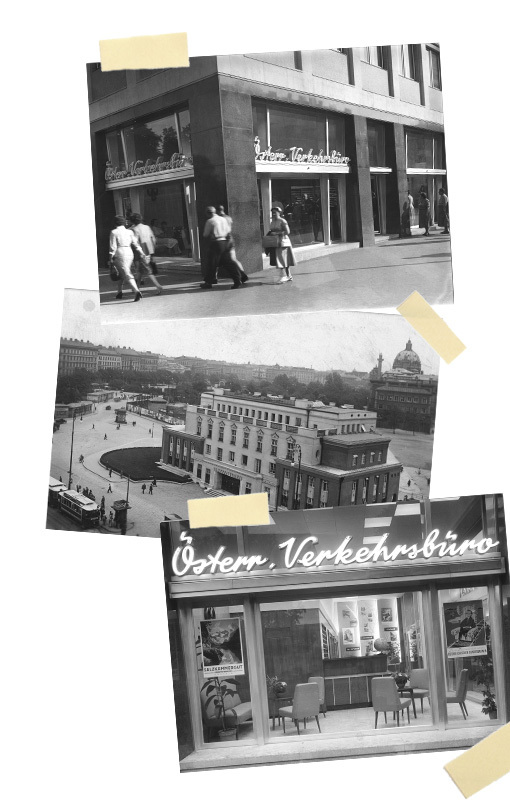 The Verkehrsbüro Group has been Austria’s largest and most exciting tourism enterprise for the past 100 years. Our 3,000 employees also want to remain Number One in the future. On relaxing holidays with Ruefa, Eurotours and Jumbo. Feeling comfortable in our modern Austria Trend Hotels and stylish Motel Ones. Celebrating in the Café Central and in Palais Events’ splendid palais locations. On stress-free business trips and congresses with Business Travel. You can always rely on us! While the headquarters in the Friedrichstrasse in Vienna are being completed in 1923, we appreciate the tranquillity of Lake Wolfgang and enjoy a boat ride on one of the Verkehrsbüro’s scheduled boat services. We plough through the water on the 33 m long paddle steamer “Emperor Franz Joseph 1”. 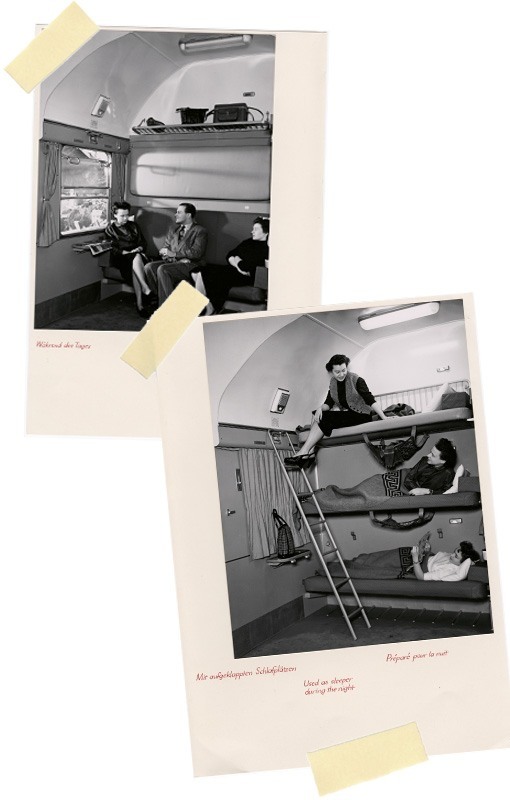 Back in Vienna, in 1958 we check into our rooms in the rebuilt Hotel Europa on the Neuen Markt. As we enter we meet a fortune-teller, who prophesies that the hotel will be successfully run for the next 100 years by the Verkehrsbüro. We love the elegant hotel lobby and the hotel manager invites us to a glass of sparkling wine. 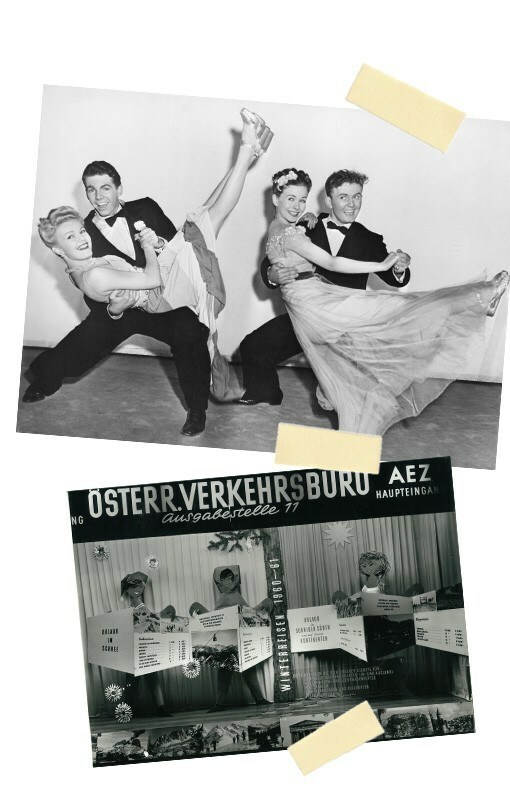 HEEL, TOE AND LIFT YOUR LEG - IT’S OFF TO THE BALL SEASON IN VIENNA! We want to get to know other hotels and in 1988 become a hotel tester for the Austropa Hotels, which are integrated into our company. Ten years later we cast anchor at the Austria Trend Hotels. We get top marks for the service and facilities in these hotels. LIKE A BOX OF MATCHES: THE CULT HOTEL EUROPA IN SALZBURG. ROOM 158 – HAVE A NICE STAY! 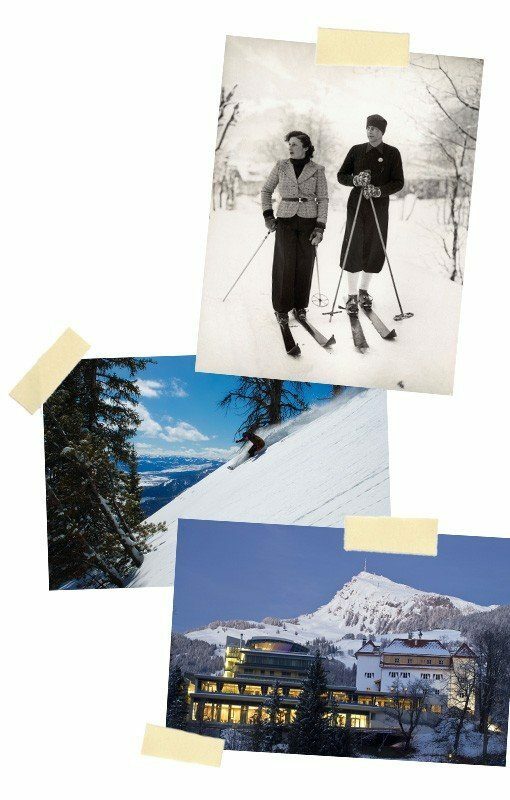 In 1998 we spend our winter holiday in the elegant Austria Trend Hotel Schloss Lebenberg in Kitzbühel. After a speedy descent down the legendary “Streif” we end the day’s skiing in one of the alpine bars. The inn keeper tells us about the Eurotours travel company, which joined the Verkehrsbüro Group this year. We buy a round of schnapps for everybody. TIME FOR A DRINK TO END THE DAY! Spring has arrived, it is 2003 and we are looking for a bargain for our summer holiday. 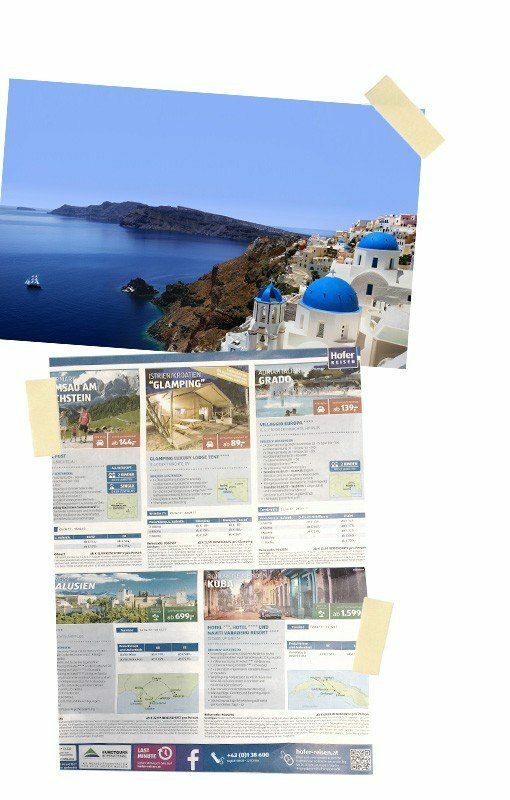 We pick up a blue folder and book an attractive package holiday with Hofer Reisen and enjoy a wonderful stay with halfboard and Ouzo on Crete. AT LAST I KNOW WHAT I WANT TO DO. I’M GOING TO OPEN A BEACH BAR. Now the holiday fever has really got hold of us. A year later and we decide to travel long-distance. We go to a Ruefa travel agency, which has been part of the Verkehrsbüro since 2004. Good choice! 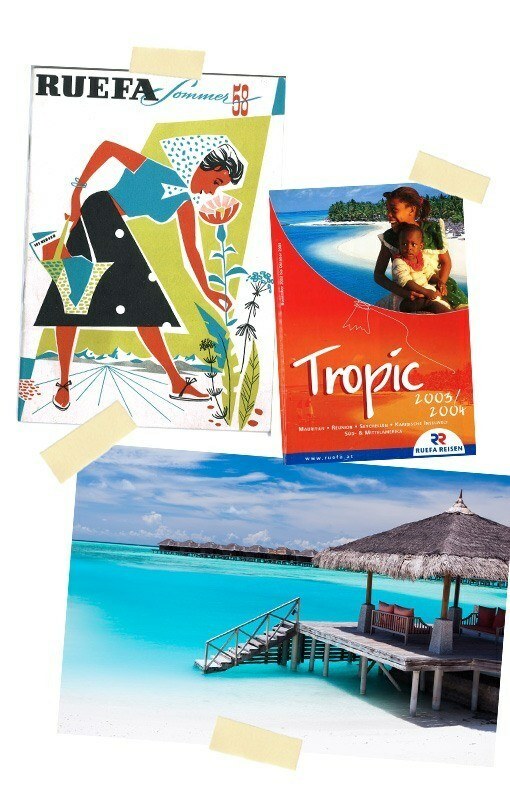 We listen to the detailed advice and leave the shop with the Maledives in our hand luggage. Thank you Ruefa and off we go! 2011 we relax in our living room, the Café Central. It is now in the hands of the Verkehrsbüro, which also plans magnificent events in Palais Ferstel, Palais Daun–Kinsky and the Wiener Börsensälen, Vienna’s old stock exchange. 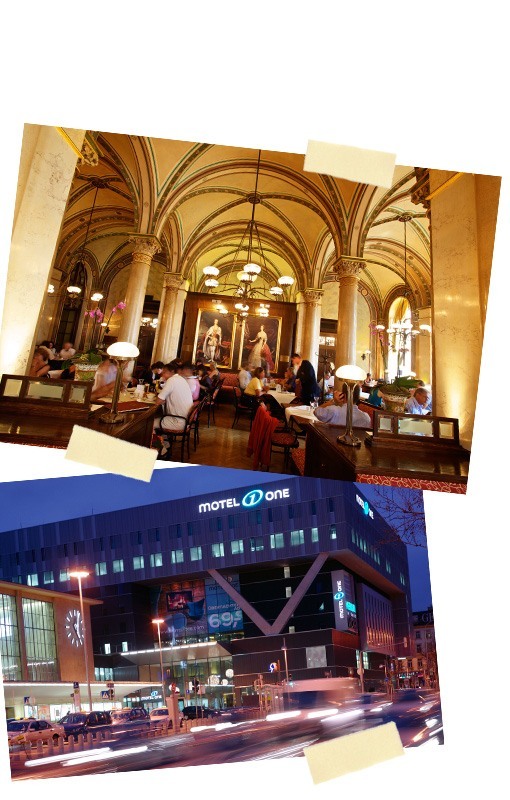 Over a cup of coffee we find out even more: about the takeover of the AX Travel Management and the turquoise expansion of Motel One, which is starting a joint venture with the Verkehrsbüro Group in Austria. We book a room and are thrilled by the design and the price. A COFFEE MELANGE IN CENTRAL AND URBAN LIFESTYLE IN MOTEL ONE. A “must see” is the exhibition by the Spanish painter, Diego Veláquez. For the first time the Verkehrsbüro appears as a partner of the Kunsthistorisches Museum, the Museum of Fine Arts. 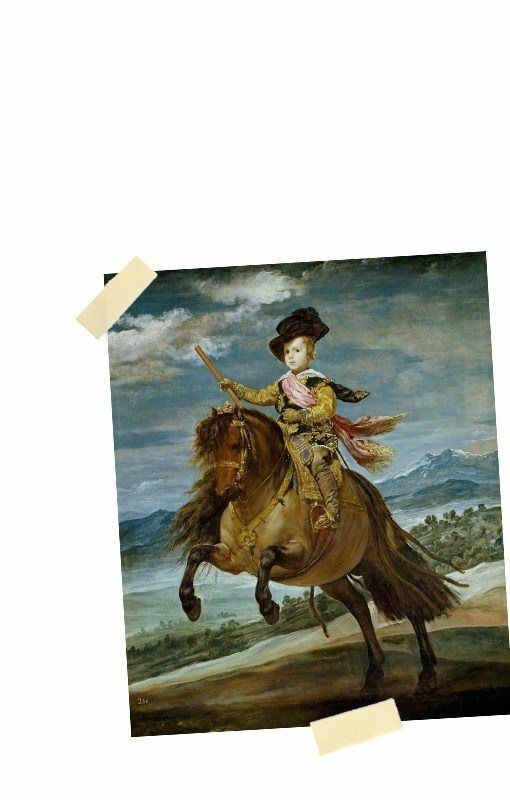 We join a guided tour, buy a poster of the “Infant Prince Baltasar” and decide to celebrate our birthday here! 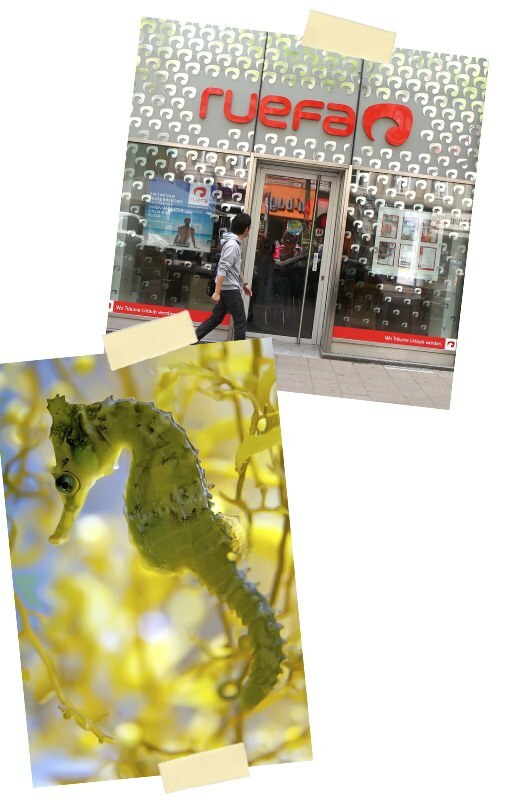 As the crowning end to our 100 year journey in back in time, in 1917 we want to ride across corals on the back of a seahorse. We ask someone at Jumbo Touristik, the experts in long-distance travel, and she recommends that we take a trip to the Seychelles. We book immediately, put on our diving goggles and don’t want to take them off for the next 100 years. ONLY THE SADDLE AND BRIDLE ARE MISSING.